Reading FC Corner 2 - Club Policy, Players (present & past), Transfer news/gossip & ALL other things 'Royals': memories, history, stats, stadium etc. Liverpool are ready to sell Ojo permanently after the young winger was forced down the pecking order at Anfield. Stoke City were said to be keen on Ojo as a replacement for Xherdan Shaqiri – who moved to Liverpool – but have cooled their interest after signing James McClean from West Bromwich Albion and Tom Ince from Huddersfield Town. Nottingham Forest and Reading are now set to go head-to-head for the 21-year-old. Forest have already spent £13m on Joao Carvalho as well as signing wingers Gil Dias and Diogo Goncalves to compete with Matty Cash and Joe Lolley. But their spending could continue with a swoop for Ojo, who has spent loan spells with Wigan Athletic, Wolves and Fulham, as well as representing England at youth level. Up front, £10m seems like a hefty fee but it could be seen as a long-term investment if they get several good years out of Ojo and then sell him on for a similar price. But Nottingham Forest do not really need another winger right now and Reading should focus on strengthening other areas if they have that money to spend. I’m not sure which Championship team would take a punt on him at this price, especially now Stoke have dropped out of the running. Reading FC midfielder Joey van den Berg is nearing a switch away from Royals. The 32-year-old was told to find a new club this summer after falling down the pecking order since Reading parted company with Jaap Stam. The Chronicle understands he has now joined Dutch side N.E.C Nijmegen on a season-long loan. Van den Berg's contract at Madejski Stadium expires next year and he will be offered an additional year as part of the deal with Nijmegen. Brighton and Hove Albion striker Sam Baldock is one of the latest names to be linked with a switch to Reading. The 29-year-old has both Premier League and Championship experience and a fairly decent track record. Royals boss Paul Clement is keen on adding at least one more striker to his squad this summer following the arrival of Marc McNulty from Coventry City. Baldock has scored more than 100 goals in his playing career to date, racking up close to 350 appearances. The frontman has represented four different clubs, these being MK Dons (2005-11), West Ham United (2011-12), Bristol City (2012-14) and current club Brighton (2014-present). Baldock has found himself out of favour at the Amex in recent times, playing only five times for Chris Hughton's side in 2017/18 and just twice in the Premier League. He did, however, score 12 goals and provide seven assists in 34 games in 2016/17 when Albion finished Championship runners up and were automatically promoted to the Premier League. Baldock's most prolific season was in 2013/14 when he netted 26 goals in 54 games for then League One club Bristol City. The striker has two England U20 caps from earlier in his career. He has been the subject of around £7m in transfer fees in his career and is valued at £3m by stats site transfermarkt.com. Baldock admitted earlier this year he still harbours ambitions of playing in the Premier League. The likes of Leandro Ulloa, Jurgen Locadia and Glenn Murray all appear to be above him when it comes to selection at Brighton, while Hughton's signing of Florin Andone at the end of May from Deportivo La Coruna means his chances are set to be extremely limited. He told The Argus in February: "It has been a really disappointing season for me. Things are out of my hands but the lack of opportunity to prove myself I have found disappointing. I don’t think there has been any more I could do in training. It is just wanting to get on the pitch and show what I can do. I want to play Premier League football and prove myself. I’ll knuckle down, keep working hard and, hopefully, that opportunity comes." 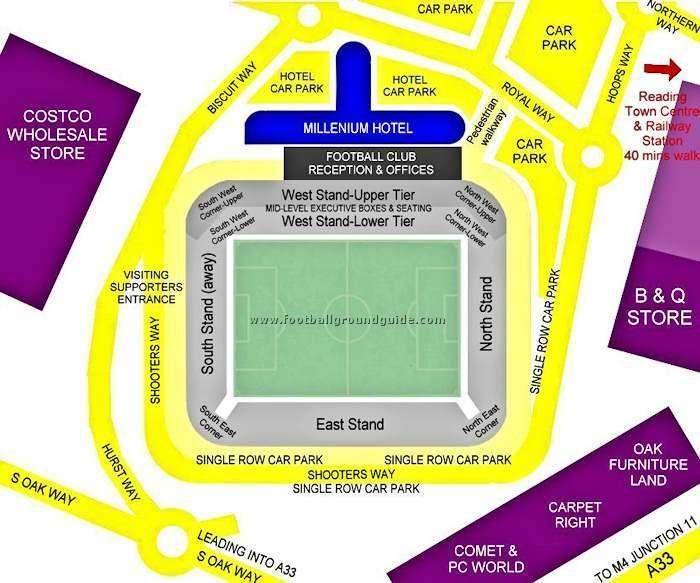 There is some limited parking available at the stadium itself for a cost of £10 but it can be a bit of lengthy process to get out of the car park at the end of the game. There are also a number of unofficial car parks in the area sited at local businesses. One of the easiest to locate is Worton Grange, which has 1,000 spaces at a cost of £8 a car. There are many residential streets nearby (Whitley district) where you can park for free, and I'd personally suggest it without reservation, but it's not perhaps the most sure area for security (and sincere apologies to the many good folk living there), and many local fans prefer to pay the £8-10 or so 'official' parking for peace of mind or more likely for pure comfort/convenience of being as close as possible. There are other car parks dotted along Imperial Way, including that large one which charges £8. The problem is that it's very large and people will spend ages waiting to get out. In fact, if you park elsewhere and drive down Imperial Way to get out, you'll see people struggling to get out of the large car park. The advantage of parking in streets on the Whitley side of the Basingstoke Road is that after a few minutes walk that getaway is far more fluid if you're heading back to the M4 again, because you won't be in those queues. Remember if travelling by train then you can save on the cost of fares by booking in advance. Visit the the trainline website to see how much you can normally save. See this excellent web site mentioned below. It's so good I wrote to compliment Duncan, the editor, on such good work. This Club moved to the stadium in 1998, after spending 102 years at their former home of Elm Park. The stadium is of a fair size and is totally enclosed, with all four corners being occupied. Three sides are single tiered, whilst on one side the West (Main) Stand is two tiered, including a row of executive boxes. This stand has a curve in its roof and the team dug outs are located in front. Unlike the West Stand, the others stands have a more conventional look to their roofs, although there is a gap between the roofs and the back of the stands, that contains perspex, to allow more light to reach the pitch. The ground has been designed with the supporter in mind as the fans are housed very close to the pitch and the acoustics are very good. The stadium also has a video screen in the South East corner. The stadium, named after Reading's chairman John Madejski is shared with London Irish Rugby Club. Away fans are located in one end of the stadium, in the South Stand, where up to 4,300 can be accommodated (although the normal allocation is 2,100). The facilities in this stand are good with plenty of leg room and the views of the pitch are superb, as there is good height between rows. Away fans can really make some noise in this stand, so make the most of it. The atmosphere is also boosted by a drummer in the home section. Entrance to the stadium is by ticket only and if tickets are still available for away supporters then they can purchase them on the day at the South Stand ticket office located between gates 9 & 10. You enter the stadium by inserting your ticket into a ticket reader which scans the bar code on the ticket and illuminates a green light to go in. Away fans – where to eat and drink? There is precious little right alongside the ground itself apart from the official complex, but there is a lot not too far away. Best is to come early, and relax with something nearby - all suggestions underneath are easily manageable. 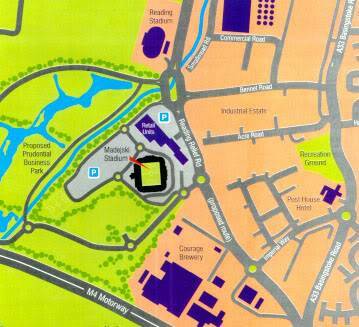 The hotel on the Madejski complex is not advised, unless you’ve simply got cash to spare (and don’t mind spending it)! “The World Turned Upsidedown” (Crown Carveries) – 387 Basingstoke Road, Reading. Just about as close as you’ll get to the ground. No advance booking necessary, and accustomed to away supporters. See here: http://www.crowncarveries.co.uk/find-us/Theworldturnedupsidedown.html Breakfast - pub - carvery. The local Retail Park (nearby, in the direction of the town centre) has MacDonalds, KFC and Pizza Hut. The main Basingstoke Road which takes you centre-bound has good fish and chip shops! Turks – just to south of town centre, along the London Road, so quite a walk from the train station but on route to ground. It’s a 16th century building, and has a reputation for being both friendly and with reasonable prices for both drinks (good variety!) and food. 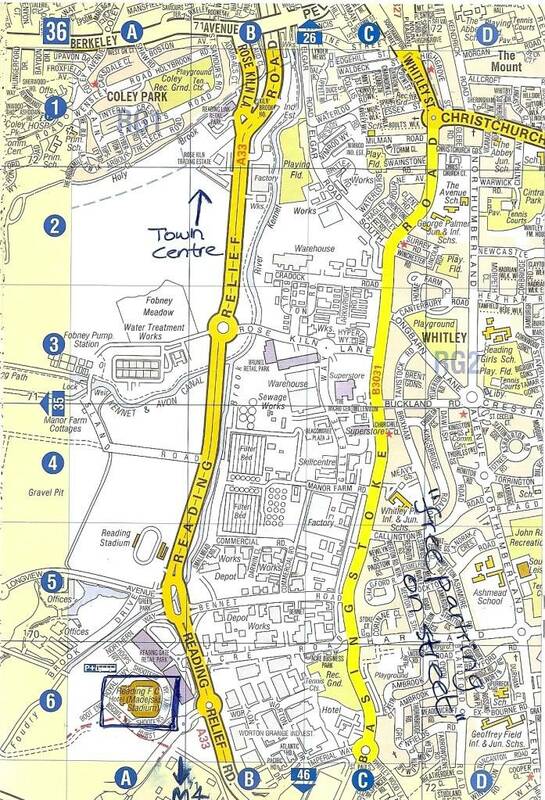 Also, a little south of centre is the Red Lion, in Southampton Street (so just round the corner from The Turks Head). It’s a traditional pub, with pub games, but doesn’t do much food or real ale. But in theory you’ll get a warm welcome. The Bull Pub in Theale, good reputation for food and has a large sports bar. Look it out here: http://thebullattheale.co.uk Only two minutes from junction 12 of the M4, that’s just before the next Madejski exit J11 (so only 5 mins in car). Also in Theale, the Fox and Hounds (Station Road, Theale) – in theory, renowned for friendly atmosphere, friendly staff and lots of Wadworth beer! The Greyhound – Tidmarsh. If you want something different and really quaint this is for you – a pub based on a 12th century thatched house! It’s not at all pricy, and has both good food and drinks … Leaving on the same motorway Junction 12 as Theale, but initially taking Newbury direction (A4) but almost immediately taking right-turn on (second) roundabout for the A340 signposted to Pangbourne. Tidmarsh village is barely at 5 minutes, therefore you are only 15 mins or so from the ground. Behind the premises is the very pretty river Pang, which at this point is divided into two separate channels (rural Berkshire!). Three Mile Cross – a village just to the other side of the M4 (southwards, as if you were going to Basingstoke). A couple of quaint pubs, good beer, and barely 10 minutes to the stadium. Advice – just allow plenty of time getting to the vicinity of the stadium. 2004-05 Division One renamed "Football League Championship"
Reading have signed goalkeeper Sam Walker on a three-year contract, after his contract expired at Colchester United this summer.Walker, 26, is reunited with Royals boss Paul Clement - who he worked with at Chelsea while a youth team player. he Gravesend-born keeper joined Colchester on an initial loan basis in January 2013 which after becoming permanent saw him make 213 appearances. "He is going to provide good competition," Clement said. ""I am looking forward to reuniting with him here at Reading, 10 years since working with him as a youth player at Chelsea. In those ten years, Sam has gained a lot of valuable experience." SAM Walker warned Reading FC’s goalkeepers he is ready to challenge for a first-team spot after joining on a free transfer yesterday (Wednesday). The 26-year-old shot-stopper signed a three-year deal at Madejski Stadium after leaving Colchester United at the end of last season. Walker, a product of Chelsea’s academy, rejected fresh terms at Colchester Community Stadium to further his career. He revealed he opted to join Royals because of the club’s ambition to return to the Premier League and his relationship with boss Paul Clement, who he worked with at Stamford Bridge. And Walker insisted he is ready to push for a place in Clement’s starting XI. Walker will join first-team training at Hogwood Park for the first time this morning (Thursday). It is not yet known whether Walker's signing will have an impact on the future of Anssi Jaakola, Royals' other back-up goalkeeper. Meanwhile, 30-year-old Mannone was heaviliy linked with a move back to Italy earlier in the summer. READING FC boss Paul Clement insisted he will not shut the door on Liam Moore should the defender choose to remain at Madejski Stadium. The 25-year-old handed Clement a transfer request on Friday in order to force a move to the Premier League. Brighton & Hove Albion have chased Moore all summer and are expected to return with a fresh offer for Reading's player of the season. However, boss Clement revealed he holds no grudges against Moore and urged the former Leicester City man to stay at Madejski Stadium. "I would like Liam to stay," asserted Clement. "He is a really good player and we want to keep our good players here. At the end of the day it will be down to our owners and whether they want to sell him or not. The timing is not ideal but if he stays then great, if not we'll have to look at bringing in another good player. I'm positive we will have a good outcome to this." Moore was left out of Clement's squad for the 4-0 thumping by Crystal Palace on Saturday afternoon. But the manager insisted he would welcome Moore back to his first-team squad with open arms. "There are no surprises in football. He's one of our best players and in the eight games I was here at the end of last season I think he was the stand-out individual. There's always going to be clubs who want your best players. I would just like to say he is a really good player and I hope he ends up staying here. These things never work out in an ideal situation but we'll manage it. Everyone has got enough experience to deal with these situations. We'll be ready to act if we need to (bring in a replacement) but hopefully it will be a positive outcome and he will still be here with us." Derby are close to completing a deal to sign George Evans from Reading. Sky Sports News understands a fee in the region of £1m has been discussed between the clubs. Evans is understood to be keen on the move and has rejected interest from Sunderland. Sky Sports News reported earlier this month that League One Sunderland were in advanced talks over a deal for Evans. The ex-England U19 made 33 appearances for Reading during the 2016-17 season as they reached the Championship play-off final, but he lost his place last term, playing just 18 times. He was part of Manchester City's academy and joined the Royals in 2016. Evans made one appearance for Man City's first team - against Sunderland - coming off the bench in a 4-1 League Cup win at the Stadium of Light. He also had three loan spells with League One clubs, Crewe, Scunthorpe and Walsall while on City's books. Reading are closing in on the signing of Brighton and Hove Albion striker Sam Baldock, according to HITC Sport. Baldock is set to leave Brighton after managing just two Premier League appearances for the club last season. The 29-year-old did hit 11 Championship goals in the 2016/17 season to help the Seagulls win promotion but fell down the pecking order once they reached the top flight. With first-team opportunities looking slim, the former West Ham United and Bristol City forward is heading to Reading to reignite his stalling career. The Royals have been in need of a new striker after Yann Kermorgant departed. So far this summer, Paul Clement has moved to bring in Marc McNulty from Coventry City to compete with Jon Dadi Bodvarsson and youngster Sam Smith could be given a go after a decent pre-season. But Baldock is now on the brink of joining and bolstering Reading’s attack. Baldock is a decent signing for Reading and he should get them a handful of goals as long as he gets decent service. Everyone knows what the diminutive striker is about nowadays – he is a natural finisher and a fox-in-the-box style of player. My only concern is that his style of play is similar to McNulty’s – Reading could have looked at signing a bigger centre-forward instead. Reading fans – Is this a good signing? This is an interesting one. He couldn't do it at Brighton and some of that is down to not been in favour but some is down to the fact he is small for a striker and is up against big burly and quick centre backs these days in the prem who know there stuff and stiffle him out. Down a league may suit him but again players now are fitter and stronger so it will be interesting to see if he has the guile to out fox the defenders. I do though personally think that smaller strikers can be quicker but work far better as a foil off a tall striker. Derby County have signed midfielder George Evans from fellow Championship side Reading on a three-year deal for an undisclosed fee. The 23-year-old began his career as a trainee with Manchester City and signed for the Royals in January 2016. Evans is Derby's fifth summer signing, after Mason Mount, Harry Wilson, Florian Jozefzoon and Jack Marriott. READING FC youngster Sam Smith completed his long-awaited move to Oxford United on Tuesday. The 20-year-old striker, who was Royals’ top scorer during pre-season, will spend the season on loan at Kassam Stadium. As exclusively revealed by the Reading Chronicle last month, Oxford were among a number of clubs chasing the former Manchester United schoolboy. The deal was delayed while Royals were in the process of bringing Sam Baldock to Berkshire and Oxford boss Karl Robinson feared he was going to miss out on Smith. But after Baldock officially became a Royal on Monday, the deal for the Manchester-born striker was finally wrapped up. Smith will join a host of former Royals at Oxford including Jamie Mackie, James Henry and Rob Dickie, who moved to Kassam Stadium on a permanent deal back in January. Smith is eligible to make his first-team debut in Oxford’s opening game of the season against Barnsley at Oakwell on Saturday. Royals are once again being tipped to struggle in the 2018/19 Championship. It looks like Reading will have to go against all the odds if they are to be successful this season. As with previous years, Royals are once again being written off and not expected to do anything noteworthy in this year's Championship. And if they are, it's going to be a very long shot. Paul Clement's side are listed as joint fourth favourites for the drop with bookmakers Ladbrokes. The 2018/19 season begins on Friday night with Reading taking on Derby Countyat Madejski Stadium (8pm kick-off). And after a winless pre-season, Clement's side are being tipped to struggle this year again - just months after finishing in 20th place and three points above relegation in 2017/18. Reading are 4/1 - alongside QPR - to go down, with only newly-promoted Rotherham United, Bolton Wanderers and Ipswich Town having shorter odds. At the other end of the scale, Royals are 16/1 for promotion - the same as Ipswich - the joint third longest odds of any side in the division. Stoke City, West Brom and Middlesbrough are favourites for promotion to the Premier League, while Derby, Leeds United and Swansea are also being tipped to be in the mix at the top. Royals are only 7/1 for a top-six finish although those odds are still some of the longest. Other odds for Reading include 9/1 to make the play-offs, 40/1 to win the play-offs, 13/8 for a top-half finish and 4/9 for a bottom half finish, while it's 14/1 for the side to finish bottom. NEWSATDEN looks at all of Millwall’s 23 opponents ahead of the 2018-19 Championship season. Next up, Lucas Ball takes a look Reading. It's been a summer of change at the Madejski Stadium so far after Paul Clement's arrival at the helm towards the back end of last season. Clement took over from Jaap Stam during a disappointing campaign that ended with the Royals finishing 20thafter missing out on promotion to the Premier League via a penalty shoot-out in the play-off final the season before. Clement has opted for experience with the likes of David Meyler and John O'Shea joining the club, but the Royals have also signed younger players such as Andy Yiadom with a point to prove at this level. Sam Baldock will be hoping to get his career back on track after injury woes while he was with Brighton. Clement also has a point to prove after his disappointing spells in charge of Swansea and Derby County. The Royals simply don't have enough quality in their ranks to mount a challenge towards the top end of the table and their defence could again be their weakness this season. If Baldock can stay fit and form a partnership with McNulty, their goals should be just enough to keep Reading out of the bottom three. Reading are hoping to sign midfielder Jay Fulton from Swansea City before the transfer deadline on Thursday. Paul Clement has been looking to strengthen his midfield and sees the 24-year-old as an ideal arrival, with the two clubs discussing a fee for the player now. That’s the latest according to Sun journalist Alan Nixon, who claims that the Welsh side are happy to sell Fulton even though he started their opener against Sheffield United on Saturday. The Scotland U21 international joined the Swans from Falkirk back in January 2014 but has struggled to establish himself as a regular since making the move. He has enjoyed loan spells at Oldham and Wigan in that time, helping the latter win promotion to the Championship last season. However, Graham Potter clearly doesn’t see him as part of his plans at Swansea and that could be because the club are trying to sign Ryan Woods before the deadline. The Brentford midfielder has been the subject of a rejected bid by Potter’s men, who could go back in with another in the next few days. This could be a good move for all parties. Fulton is a good player but needs to play regularly to prove that after years of not featuring enough. If that’s not going to happen, maybe because of Woods’ likely arrival, then he will have to move. For Reading, he is a good option as he is capable on the ball and is still developing as a player so would be a smart signing. The Argus reports that Brighton & Hove Albion are now unlikely to sign Reading centre back Liam Moore. It is understood that any chance of the deal going ahead are ‘receding’, as Brighton have not made any ‘recent contact’ with the Sky Bet Championship club over the player. Moore recently handed in a transfer request at the Madejski Stadium in order to try and force through a move away before today’s 5pm deadline. It would appear that Brighton are the only club to have shown a serious interest in the player. He now could be left red-faced, as he faces the likely prospect of remaining with the Royals until January at the very least. Whilst Brighton would ideally like to add a fourth centre back to Chris Hughton’s squad before the summer transfer deadline, it is clearly not a pressing need in the eyes of the former Newcastle United head coach. This will serve as positive news to Reading fans, who are desperate for the player to remain with the club. The fact he has handed in a transfer request certainly will make it tough in the eyes of some supporters to accept, however, he is clearly the best defender they have at the club. Manager Paul Clement will surely be delighted to keep him on the books, and the player will surely get his head down and perform if he does remain. Clement left the player out of the squad in the opening day defeat to Derby County last Friday. Goalkeepers, defenders and midfielders - they are the types of players required at Reading if you believe the recent rumours. It's safe to say Royals are well stocked in certain areas but are pretty short in others. Boss Paul Clement has spoken of a need to balance the side and said he is looking to explore the loan market which is open until the end of the month. But what areas need strengthening? And which could do with trimming? Here is the full squad list of senior players available to Clement as it stands and a verdict on each position. Verdict: A pretty well-stocked position. Rinomhota will go out on loan while Edwards and Clement may look for moves as it's hard to see them getting much game time. Verdict: When all fit, arguably Royals' strongest position. Popa, McCleary and Harriott all still have to come back. The start of the season has been tough for the Berkshire side, losing all three of their league fixtures and only scoring a single goal. Boos have been heard ringing around the Madejski after a 1-0 loss to Bolton on Saturday, and some fans are rapidly losing their patience with Paul Clement, after only 11 league games in charge. So what has caused these issues, I hear you ask. Well, here are just a few of the possible reasons. Clement hardly inherited the most talented squad in the league, so he would have hoped to be blessed with a significant budget in the summer window. Unfortunately, he wasn’t. The majority of his dealings this summer have been free transfers, excluding the deals for Sam Baldock and Marc McNulty, so Clement and Reading fans alike have reasons to be aggrieved by the lack of activity by the ‘billionaire’ owners. The Royals does not have a good enough squad to survive comfortably in this league, as shown by the disappointing showing last season, so improvements have been a necessity. Other than Andy Yiadom at right back, none of the new signings have improved the squad too much, yet. However, the loan signing of Josh Sims is a shrewd piece of business, so hopefully, he can help change the fortunes of Reading. Reading dominated the opening two fixtures this season, but couldn’t finish off the chances and put the game to bed, which ultimately cost the Royals. In both of the opening games they had so many opportunities to get the ball into the area and give the forwards a chance to put Reading ahead, but the delivery was poor, and the chances went begging. It is going to cost the Royals a lot of points this season if they can’t improve the supply to the strikers. It was the same problem last season and look where Reading ended up. It is going to be a long, hard season for the club if they can’t create more clear-cut chances and capitalise on the games they are dominating. Supporters went into the season with a sense of nervousness after last season’s showing, and understandably so. But it seems as if the players have also started in a negative frame of mind, almost expecting the worst, which is precisely what you don’t want at the start of a new season. Every time Reading concede, their heads drop, and nobody seems too bothered about whether they lose the game or not. They all seem too happy just to turn up, lose a game and get paid for it. A few exceptions to this are Liam Moore, Mo Barrow and all the new signings (have not seen enough to judge just yet). Hopefully, results turn around and the atmosphere around the Madejski can improve in weeks to come. What do you guys think, looking in from the outside? Last season was Reading's worst league position finish in 15 years, after almost having been a yo-yo team between Premier/Championship. OK, you'll say, we should be grateful for a nice 21st century so far! But this season ... almost rock bottom (maybe QPR are even worse?!). But have we entered a downward spiral? If so, Division 1 awaits us next season. How do you see things? From a rather despondent Daib0! !